Want to know more? Here are some great reasons why you should be eating blueberries. Plant compounds called phytochemicals give blueberries their beautiful color and also function as antioxidants. That means they help prevent free-radical damage to cells. Antioxidants are thought to have a variety of health benefits — at least when you eat them in the form of food. Taking antioxidants as supplements doesn't seem to work as well. Blueberries are an excellent source of B-complex vitamins your body needs to convert food to energy and vitamins C and E that add more antioxidant activity. 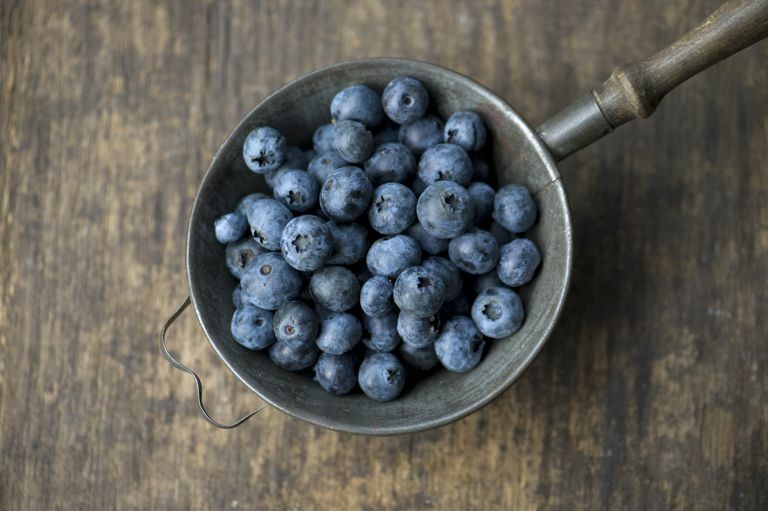 Blueberries have plenty of minerals too — including potassium, selenium, zinc, iron, and manganese. One full cup of fresh blueberries has only about 80 calories, which is great for your waistline. They're a good source of fiber so nibbling on some blueberries can help tide you over until your next meal without ruining your diet. Blueberries are often compared to goji berries and acai, which are a little more exotic, difficult to find and more expensive. Blueberries, however, are much easier to find in any grocery store — and they're available year round. You'll find fresh blueberries in the produce section. Look for berries that are plump and dark in color — avoid blueberries that are shriveled or moldy. Blueberries are also available in the freezer section. My first four reasons you should eat blueberries aren't of much value unless you're willing to eat them. But that's the easy part -- they're so tasty. They can be served as a simple dessert with a little whipped topping and chopped nuts or added to a bowl of hot or cold cereal. Blueberries also make a great addition to a healthy salad and can be used as in ingredient in some recipes. Look for recipes that aren't too high in sugar or fat and that call for healthy ingredients like whole grains, other fruits and vegetables and lean protein sources. Try some banana, blueberry, and walnut spelt bread. The following nutrition information comes from the United States Department of Agriculture's massive nutrient database. It's for one cup of raw blueberries. Agricultural Research Service United States Department of Agriculture National Nutrient Database for Standard Reference Release 28. "Basic Report: 09050, Blueberries, Raw." http://ndb.nal.usda.gov/ndb/foods/show/2166.